Kobs are ecologically restricted, preferring low-lying flats or gently rolling country free of seasonal extremes and close to permanent water. They compete for these lands with humans, who need them for farming. The social structure of the kob is based on small herds that come together into larger groups of up to 1,000 animals. These large groups will contain 30 to 40 breeding males that hold territories. Like many other antelope species, breeding only occurs within areas controlled by an individual territorial male.The holder of a territory is constantly being challenged. If he loses his territory, either through a fight or by leaving it to graze or drink, he joins a bachelor herd of males. When he recovers his strength, he will try to regain his territory. Kobs often associate with larger animals such as hippos, buffalos, topis and hartebeests. These animals help keep the grass short, as the kob prefers. 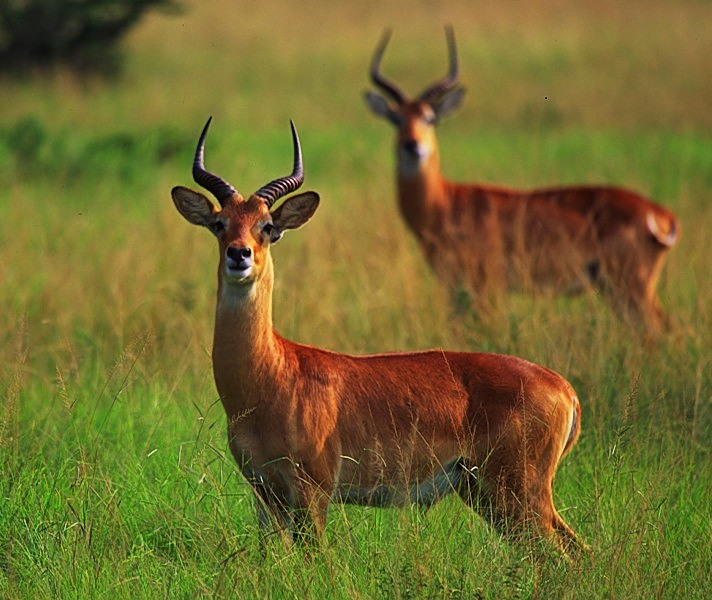 Like reedbucks and waterbucks, kobs develop attachments to particular localities, returning to the same grazing areas and watering places day after day, season after season. During the first 7 months of life, the mortality rate is high, with only about half of the kobs surviving predators such as lions, leopards, spotted hyenas and hunting dogs. When threatened, the solitary kob will lie flat and still or take to water to escape its hunters. Very good capture, i like the effect with the second animal, perfect light to. What a lovely image.The composition is just perfect almost as if they were posing for you. Good depth of focus and i like the strong colours.Well done. Nice shot. Sharp and well exposed giving fine details all over and excellent color saturation. I like your balanced composition where the elements are well located. Beautiful shot, tack sharp, good contrast, very rich colours and a very nice mirror-effect. Well spotted and excellently captured double feature! I like the DOF effect with the second subject OOF and emphasising focus on the first. A very nice composition with great detail and color. Both at attention! Ma che razza di colori caldi: ma � sempre cos� la luce in Africa? Wooooooooow ! What a wonderful and interesting shot that you have very well done ! I also appreciate the complementary note... Congratulations Andrea and thanks for sharing. Well composed Andrea ! Very good warm light, well exposed and sharp. Thanks ! fantastic light and colours, the second animal is excellent, but it is a shame that your lens was dirty... there are spots all over the picture and I woudl have like to see the front animals legs, even if it was only an illusion of seeing them. Still lighting, colours and composition are excellent. Pleasant composition for eyes in view of the coming sun. But they have seen the photographer. Work is pleasant. Ooooh they look so lovely. Nice colors on image, very good lightness, great work. Beautiful, well composed, the light is right.. well captured. Shame the DOF is not a bit longer. What an amazing photo. To have two Kobs looking at you at the same time in the same posture. Excellent color and a beautiful soft warm light. This is a beautiful shot, the POV/composition is superb. I really like the use of shallow DOF as well, it works very well here. Lovely work! Really well composed, with very natural and beautiful colours. The two kobs with same pose is find. A beautiful photo, as most of your gallery. Beautiful capture.I liked the composition,including the second one in the frame little blur.Good POV&TFS! Ho visto ora questa tua foto..... superba! Great picture. Second one blurred is a wonderful! I like the rich colors in this image, and the composition with the two animals is excellent. a beautiful wildlife scene...the composition is perfect and the pose of this graceful animals is fantastic...looks like the Kob in the background is a duplication of the one in the foreground! Nice color and DOF with the second male. I love how proud and regal the males appear. No wonder the are Uganda's national animal. Awasome composition. I very much like the two kobs, which are in the very same pose, while only one is in focus. Great scene. The photo is over saturated in my taste (it is only a matter of taste). Extremely well presented; with EXCELLENT taste. The focusing of your main subject is P.E.R.F.E.C.T.